The Dentist uses your check-up to see how healthy your mouth is, whether you might need some work done and, in the case of children, how the teeth are growing and developing. The Dentist will have a look round inside your mouth, checking the teeth, as well as your tongue, the soft palate, the inside of your cheeks and the roof of your mouth. As well as looking in your mouth the Dentist will ask you some questions like whether you have had any pain or sensitivity in your teeth and gums recently, what you general health is like, whether you’re on any medication at the moment and what your diet is like. Your dentist will normally take a couple of X-rays during your first visit to ensure that your teeth are all healthy in areas not visible. Your initial check-up will take approximately 30 minutes. Each patient at Eden Dental Clinic is treated as an individual so that the best result for you is achieved. 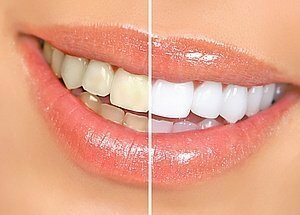 Teeth whitening involves taking impressions of the teeth from which trays are made. Carbamide peroxide gels are used in the trays to whiten the teeth. Our dentist will show you how to apply the gels into the trays and give you all the instructions you need before you leave so that you can carry out the whitening correctly at home. You can wear your trays at any time in the day for 1-2 hours per day over a period of 2 weeks. After this time you will be asked to return to your dentist so that the shade of your teeth can be reassessed. The majority of fillings provided are white composite resin. This has a number of advantages over the silver amalgam restoration. It is adhesive and minimally destructive and extremely cosmetic, blending into your own tooth colour. A crown is used to restore a tooth when it is broken, discoloured or filled so that it requires a full cap to provide improved function, strength and appearance for the patient. All the best materials are used to ensure a high quality result. Scale and polishes can be carried out to remove tartar, calculus and plaque as well as any extrinsic staining caused by tea, coffee, red wine and smoking. (Intrinsic staining may require tooth whitening to remove). Instruction may be given on cleaning between your teeth with floss or inter-dental brushes and help with general tooth brushing may also be required. This is all with the aim of providing each patient with the knowledge on how to maintain their dental hygiene at the highest standard. Gum disease can affect both men and women of all ages. The teeth are attached to the bone of your jaw by ligaments. When you do not clean your teeth properly, plaque and tartar build up around the neck of the tooth next to the gum. This in turn causes an inflammatory reaction which leads to the destruction of the ligaments. With this the gums recede and the bone starts to disappear. If this is allowed to happen over a long number of years it can result in the teeth becoming loose and eventually they may need to be extracted. Gum disease is more common in patients that smoke and diabetics. If gum disease is present our dentists will provide you with treatment aimed at stopping the gum disease progressing and maintaining excellent oral hygiene. At each examination appointment your dentist will carry out a routine check for oral cancer. Patients who smoke and drink heavily are at greater risk from oral cancer. Often patients will be advised to quit smoking and reduce their alcohol intake to reduce this risk. Bridges are used to restore gaps where teeth have been lost. This usually involves crowning a tooth at one side of the gap and sometimes at both sides of the gap. The gap is filled by an artificial tooth bonded to the crown. When a tooth has deep decay, a deep filling or has undergone trauma the nerve within that tooth can die. This in turn causes inflammation and resulting pain. Root canal treatment is a brilliant way of alleviating this pain and subsequent infection while retaining the tooth in the dental arch. Sometimes when a tooth has fractured or it is no longer possible to restore it is necessary to extract the tooth. Prior to the extraction being carried out they will be able to offer you an extensive range of options to restore the space so that you can continue having a functional, aesthetic smile. To replace missing teeth sometimes requires a partial denture. This is usually a removable prosthetic device and can be made in either all acrylic (a plastic material) or with a metal base (cobalt chrome). The main advantage of this design of denture is that the base plate is much thinner than the acrylic and as a result many patients tolerate them better as they can feel more comfortable. They also allow for improved taste and thermal sensation because they do not cover as much of the palate in the upper arch. They are supported largely by the teeth. These are made in a plastic material and the forces on them are both tooth and soft tissue born. The bases are slightly thicker than cobalt chrome but they are less expensive.